Adding to the excitement of the New York International Auto Show, Popular Mechanics announced that the 2018 Alfa Romeo Stelvio has been named "Crossover of the Year" in the magazine's annual Automotive Excellence Awards. To choose their car awards, editors drive all of the relevant class contenders over the course of the year, then pick the vehicle that they feel transcends the competition. 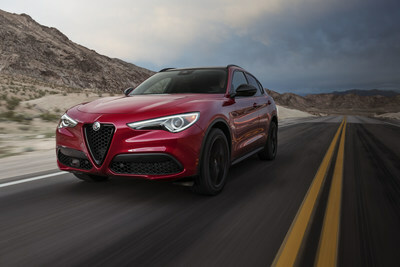 "The Stelvio is the Giulia of crossovers, and that's about the highest praise we can give it. It's got muscle, even in four-cylinder guise, but it's also one of those cars that's fun to drive at any speed, because of the way it feels," said Ezra Dyer, Automotive Editor at Popular Mechanics. "The steering is light but not numb, the ride control is taut without being harsh. It was obviously tuned by people whose priorities skew toward performance. The Stelvio feels like an Italian sport sedan, only taller. Which is exactly what it is." Born from the world's greatest driving road – the Stelvio Pass – the all-new 2018 Alfa Romeo Stelvio sets a new benchmark in performance, style and technology in an SUV that could only be Italian. The innovative Q4 all-wheel-drive (AWD) system – standard on all Stelvio models, including the Quadrifoglio, provides additional driving confidence and superior control. The Stelvio Quadrifoglio – on sale in early 2018 – holds the Nürburgring record for the fastest production SUV with a lap time of 7 minutes and 51.7 seconds. Infused with Italian passion, craftsmanship and innovation, the all-new Alfa Romeo Stelvio conquers the winding road for which it is named. As the first of a new generation of vehicles on the all-new Giorgio platform, the 2018 Alfa Romeo Giulia and Giulia Ti sedans deliver race-inspired performance with a class-leading 280 horsepower, advanced technologies that include the available Q4 AWD system, seductive Italian style and an exhilarating driving experience to the premium mid-size sedan segment. As the "halo" model in the lineup, the Giulia Quadrifoglio highlights Alfa Romeo's motorsport knowhow with a best-in-class, 505-horsepower, 2.9-liter twin-turbo V-6 engine that earns the title of the most powerful Alfa Romeo production car engine ever and the quickest with a class-leading 0-60 mph time of 3.8 seconds, plus it enabled a record-setting Nürburgring lap time of 7:32 – the fastest ever by a four-door production sedan.